I go through phases with my TV watching. For a number of years, food shows were the staple (hah) of my TV time and I hungrily watched everything from the gentle Saturday PBS line-up with the likes of Julia Child to the cupcake brawls on Food Network. Then we cut cable and I moved on to other genres, other shows. In the last fortnight, foodie TV came back into my life in a delicious way with a show I found on Netflix streaming- Series 5 of The Great British Bake Off. The premise of the show is pretty standard- they find a dozen talented amateur bakers from around England, host a bake-off every weekend and eliminate one contestant at a time, and then crown a winner by the end of the season. The competition is held in a tent on the picturesque grounds of a country manor. The demeanor of the contestants was utterly refreshing. They were good-humored, gracious and self-deprecating. The youngest baker in this series was only 17 years old. She is a high school student who lives with her parents. Her talent was mind-boggling. Then there were bakers in their 60s. I guess you're never too young and never too old to participate in life's big and little adventures. My favorite contestant was a guy from suburban London- a builder by profession who has a delicate touch with pastry. It is great when people are liberated from gender roles and allowed to pursue whatever the heck interests them. The bakes were gorgeous and impressive, needing true talent and skill- the bakers had to make things like filo pastry from scratch. Each episode has an theme (say, cakes, or breads) and three parts: a signature bake (something that is a specialty of the baker), a technical (where bakers were given a rather vague recipe for a obscure baked good and had to bake it on the spot) and showstopper (making spectacular and elaborate bakes). This wiki page has an amazingly detailed write up of this series. While I myself don't much care for either baking or eating elaborate baked goodies, it is all very fun to watch. The first challenge of the first episode involved making Swiss rolls. Watching those spongy cakes being rolled up with all sorts of interesting fillings made me want to run into the kitchen and bake a Swiss roll right away. Real life intervened and while I did end up making a roll this weekend, it was not quite the sweet and creamy type that I saw on the show. It was savory and there was no baking involved. This was a variation on the Maharashtrian snack/side dish called alu wadi or pathrode, in Gujarati these are called patra. A thick paste of besan (chickpea flour) and spices is spread thinly on giant colocasia leaves and they are rolled up tightly, and then steamed. The cooked rolls are sliced to reveal pretty spirals, and then pan fried to golden crispy perfection. I love this dish, so why have I never made it? Partly because it sounds like an elaborate and time-consuming process, and partly because colocasia leaves are not available where I live. But there is good news on both counts. Collard greens, widely available in supermarkets around here, are a wonderful substitute for colocasia leaves with their wide and sturdy leaves. 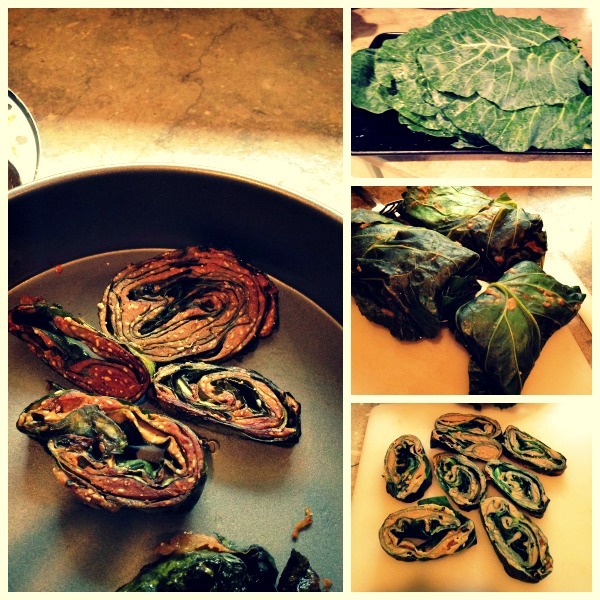 In fact, I found a good recipe for collard greens wadi and followed it very closely. Making the collard greens wadi was very straight-forward. The bunch of collard greens from the grocery store was massive- a bundle of about 25 leaves for three bucks. 1. Prep the leaves: Fold each collard leaf in half along the middle, then slice off the thick middle vein. You're left with leaves with a narrow wedge in the middle cut off. 2. Rinse the leaves well in water and pat dry. 3. Make the paste: Mix besan, rice flour, spices (turmeric, red chili powder, coriander cumin powder), flavorings (salt, jaggery, tamarind paste), and seeds (sesame seeds, poppy seeds). Add just enough water to make a thick paste. Next time I will add some oil to the paste. 4. Make the rolls: Lay down one leaf, spread some of the paste on it. Lay another leaf on it, alternating the direction, spread more paste. I built layers of about 5 leaves. Then roll the whole thing like a burrito- folding in the sides, then rolling tightly. I made 2 rolls. The rolling can be very imperfect- the whole process is quite forgiving and once steamed, the rolls look fine. 5. Next, steam the rolls for 15 minutes. 6. Cool the steamed rolls, cut into slices (a serrated knife works well) and pan fry in oil until golden brown. We served the collard greens wadi as a side with bisibele bhaat for a weekend brunch. I still have half the leaves from the bunch left over and I'm thinking I might make, steam and slice some more rolls and stash them in the freezer, to the thawed and pan-fried over the next month or two. If I manage to find some time, and a baking sheet of the right size, I might end up making a Swiss roll for Halloween- I have my eye on this pumpkin cream cheese roll. Do you watch much food-themed TV? Have you seen The Great British Bake Off? I'd love to watch the other seasons of this show. What have you been cooking and baking? "...I have my eye on this pumpkin cream cheese roll." Do it! You won't regret it. A pumpkin roll has become a tradition for Thanksgiving in my family's get-togethers. OK now you have me all excited to go buy the right-size pan and try this recipe!! oooh wow! This must have tasted so good! I bought collard greens with the intention of making alu vadi but eventually made a curry with black eyed beans. I should get some again and try these while they are still around. They tasted wonderful! I'll be making this recipe again and again, it looks fancy and special with very little work. Wow- anarse sounds like a great project to take on! How about that?! :D I wish they had more seasons on Netflix! I think the swiss rolls struck me as being challenging but also manageable. I mean, I am not about to make filo dough from scratch ANY time soon. Wow, this looks SO good. You made me hungry for alu wadi. Haven't had it in years. I'm getting collard greens to make this when I go grocery shopping tonight. We too are without cable for over a year and I miss watching food network and HGTV. I used to watch these two so much that my husband would joke and tell me that we are paying for other channels too. I'll check this show out. My daughter is 2.5, and just started preschool. I'm very excited to bake sugar cookies with her for her school Halloween party. Looking forward to your swiss roll recipe! Aww- such fun to bake with the little ones! Amruta- you will LOVE this show- promise. 100 times better than anything I've seen on Food Network. What I love about this collard greens wadi is that you only need to shop for one ingredient- the collard greens. Everything else is basic Indian pantry ingredients. Oh, I just read the recipe for the pumpkin swiss roll, and the ingredients are very similar to Pumpkin Cream Cheese Muffins, I'm planning to bake for Halloween. Pumpkin and cream cheese is a winning combo! I love the great British bake off and have watched multiple seasons of it. I still watch reruns when I can. As the series nears finals I go giddy with excitement! :) . Also I like the Judges and the presenters too. And you get to learn a lot of tips and tricks about baking. Shruti- I miss having PBS :( Netflix has only 1 season. You're right, you learn great tips about baking- it is altogether an inspiring and enjoyable show. I miss having PBS! Probably the only channel that I really miss. Funny you should mention having something in common with the kids to watch- Lila has been very interested in this show, and we watched some of it together. So funny, I just discovered the Great British Bake off this past weekend and I am OBSESSESED!! I have a british obsession anyways and this show hits so many of them for me. But yes, I was so impressed with the 17yo as well. She is so amazingly poised - I can't remember doing anything like that when I was 17! Anyway, can't wait to watch the rest of the episodes. I love pathrode too - luckily my mom (who lives pretty close) grows the leaves in her backyard and makes it often enough. So I just go visit home to get my fix ;-) Let us know how your Swiss roll comes out. YAY another fan :) The 17 year old was wonderful to watch- such fun when you discover a passion at a very young age, and when parents let you pursue it. I love the Bake off and watch it religiously every year. I also really like the Hairy Bikers, Two Greedy Italians and Nigella. In and Out the Kitchen was a lovely cooking themed comedy audiobook I listened to last month. Arpita- you're watching all these shows on PBS? I have to look into subscribing to PBS if they have a streaming option...it is the one channel I miss very much. Thanks for the audiobook reco! Nupur I watch bad quality videos that ppl upload to YouTube :)I try to watch them as they occur in the UK. .. That way sometimes the videos have better quality... I believe PBS is streaming a few initial episodes, via their free online app but it is v limited. How does adding oil to the besan batter help? Adding oil would make the batter softer. At home, we love GBBO and the last series was the best ever. It was representative of modern day Britain with the winner being...ok, won't spoil it for you. Mary Berry is an institution out here and her personal tragedy means, I have a massive soft spot for her. Also, which other 80-year do you know who can carry off a pair of jeans quite as stylishly as Dame Mary (not yet knighted but hopefully, soon). These wadis remind me of my few years in Mumbai and of those days when I used to stop for a top up at the sweet and savoury shop just outside Andheri station on my way back from work. I never thought to use Collards to roll wrappers. As ever, your recipes are a huge inspiration. Great work, Nupur! I know the winner of the last series- it was all over the news. Mary Berry is amazing, is she really 80 years old? Abhi- any large green leaves that are locally available will do to wrap the wadis. collard green rolls look amazing. I love alu vadi and can make a really good one (If I may say so myself). Its a great do-ahead kind of recipe. We moved back to India after a decade of staying in the US, so currently getting adjusted to the new town (bangalore). I have not been cooking/baking anything currently! We found a cook who cooks really good food and have been outsourcing that work. The joys of eating home cooked food after coming home from work is amazing :) I am planning to break open the new oven once all our stuff (along with my baking pans) arrives next month. There was a time when I used to devour shows like chopped on food network and Masterchef, but it was just too much drama to continue watching everyday! These days we are watching the new series (not food related) Quantico. Really good. Neha, I'm sorry (but not really) for crashing your comment--maybe you've seen my comment above. I too live in Bangalore. If you find colocasia leaves anywhere, I'd love to know. I miss alu vadi so much! Im new to your city! Been just 2 weeks in bangalore for me :) Have not seen the leaves in the couple of vegetable stores I visited. Do you have an email id? We can be in touch. Apologies for this private chat on your blog, but it would be very nice to make a friend here. Chat on- if you find a friend through this blog, I'd be delighted. You may be able to get PBS over the air. Also, some streaming devices offer the PBS app where you can watch some shows. Where I live, I'm told there is a problem getting signals for the basic channels over the air- poor reception and all. I must ask around and see if there are solutions for that. I do have the PBS app on my Roku; they have a few limited shows available. Ah I now determined to make these for Diwali dinner. My mother made these very regularly and used bhajani instead of besan(she was allergic to besan). It makes them more khamang! Collard greens is a good idea. I once made aluchi patal bhaji with cauliflower leaves that I got off a cauliflower I grew. I should have made vadi. I'll let you know how it goes. I am setting up for a marathon faraal making with a friend next weekend. Looking forward to making karanji and kadbola. Oh man a faral making session sounds like such fun!! I'll probably make one sweet and one savory thing, and a festive dinner. Diwali on a tiny scale. The PBS site has a few episodes of another season, I did watch them! and they were great. So if I ever come down yonder to your place I know what to carry with me- aloud leaves from bay area(yep, every once in a while our local Ranch market carries piles of them!). But the collard ones are helluva easy options too, I've tried them just once but now spying them here I feel an urge to make them soon. And so I shall. Deepa- I can imagine the abundance of fantastic produce where you live! To be honest, in this case I'm not missing the alu leaves. Collards taste great, and don't have the scratchy properties of alu leaves. Oh, I saw the British bake off on Netflix too. Enjoyed it thoroughly. The setting was so.... Perfect! I have made collard-aLu-wadi a while ago and loved it. But did not repeat as patra leaves are easily available in Dallas. But I have to go back to collard now. Moving again - I'm almost, heartbroken. NOTHING compares to this place, everything is big in Texas, and I am going to miss it. I'm packing now and it's chaos. Just longing to settle down and sort things asap. Btw, Midsomer murders season 16 is on Netflix - just 5 or 6 episodes, but ! It's here! Yes, the setting of the bake-off was so great, and I loved the personalities of everyone- judges, contestants and hosts. You guys move a lot! Hard work it is. Good luck with the move and with your new home. I am sure you'll find new things to love. Nupur, I recently came across this blog and am amazed at the variety of the dishes churned along with the other added accessories like the books read, movies watched, lovely.. its like a kitty club of your own. I love cooking, but I complain a lot about the cleanup and the mess afterwards. I am bit quirky too as am always reluctant to go buy items specified in a recipe, love to try few recipes of yours with a twist of my own. Congratulations on this wonderful journey for over a decade now!! Using collard greens to make the much loved "aalloo-wadi" is an inspiring idea! I've been following your blog through the past decade and through my moves across the US and India (back in the US now) and its wonderful to read your recipes with updates of your activities. You are an inspiration Nupur! I have to cook for someone who detests anything that remotely resembles veggies but I think this recipe may just do the trick! Thank you so much for this nice note! This recipe is tasty and worth a try, I promise you. But it must be hard to cook for family members who don't like veggies- yikes. Do you think we can make Alu chi amti using collard greens?